Last fall it felt like all anyone could do was compare the three currently-running female-lead superhero shows to one another. Agent Carter, Supergirl, and Jessica Jones are all fantastic shows in their own rights, but it felt like all anyone was writing thinkpieces on was how one was better than the others, how these shows about women were actually in competition to see which one would be the actual female-lead superhero show. Because, you know, there can only be one. I wasn't down with this concept then and I'm not down with it now. The media tends to put out this idea that women and women-centric properties need to be in competition all the time, that women are such a niche interest group that there's only enough audience for us to have one show at a time, but we all know that's complete crap. So when Agent Carter came into their second season swinging hard at the idea of women being in competition with each other, I was totally and completely there. Granted, that's not the only theme of Agent Carter's most recent foray into investigative punching, but it's the one that resonated most with me and I think most with other viewers too. The love triangle fell flat, the crisis was only okay, and the overall feel was a tiny bit tired, as if by moving the show from New York and Los Angeles they lost the city oomph they had before. Not that this was a bad season, but more that the things I liked in it don't seem to have been the ones I was supposed to. Oh well. What I did absolutely love this season I loved for very good reason. Because here is a season of television that is all explicitly about how Peggy Carter has no interest in or time for women being told that they have to compete or be jealous of each other or in any other way tear each other down. Each time the narrative brought in another female character who Peggy could potentially have conflict with, she responded with kindness and friendship and in most cases they ended up allies. That's a hell of a skill, and a hell of a statement about female solidarity. 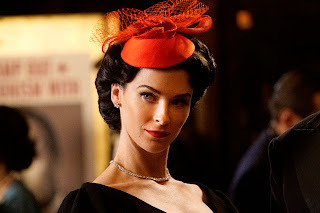 After capturing the enigmatic and terrifying Dottie Underwood (Bridget Regan) when she tried to rob a bank, Agent Peggy Carter (Hayley Atwell) is happily interrogating her nemesis until her boss, Chief Thompson (Chad Michael Murray) gets all insecure and ships her off to Los Angeles to help on a case there. That raises complications of the feelings kind - the Los Angeles SSR is currently being headed by Chief Sousa (Enver Gjokaj), the guy that Peggy declined getting drinks with last season because she was all understandably mourning the love of her life. 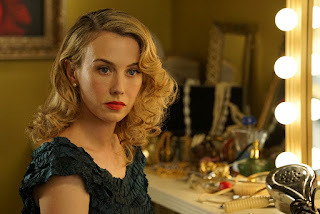 Never one to back down from a challenge, though, Peggy shows up in LA and quickly fall face-first into another conspiracy, accompanied as always by her best friend Jarvis (James D'Arcy). Also we finally get to meet Ana Jarvis (Lotte Verbeek), his fantastically amazing wife. Peggy and Sousa investigate some crimes about some stuff - a mysterious murder and theft at a lab - which introduces them to Jason Wilkes (Reggie Austin), a brilliant scientist working on some very experimental stuff. Peggy and Jason immediately hit it off and he successfully turns her interrogation of him into a date, but it all goes to crap when Jason goes back to the lab to get the "zero matter" he's been working on so that he can help Peggy with her investigation. While he's trying to get the zero matter, he runs smack into Whitney Frost (Wynn Everett), a Hollywood legend who happens to be married to the head of this company and seems to know a little too much about zero matter. Oh, and there's a super shady council of old white guys who secretly control the country. But that's par for the course by now. The zero matter explodes, Jason and Whitney are both caught in the explosion, and the story goes from there. It's full of twists and turns, most of which are pretty interesting, but the real emotional arc of the season seems to be the question of what will happen to Peggy's love life. Will she end up with Daniel Sousa, the coworker who understands and appreciates her but happens to be dating someone else now? Or will she go after Jason Wilkes, the brilliant scientist who also knows what it's like to have every door shut in your face? Choices choices. 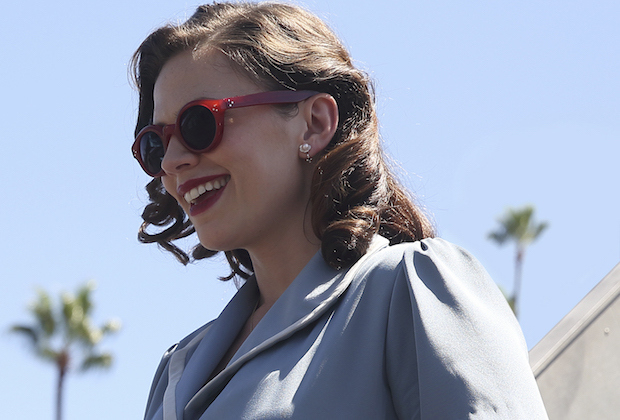 Personally, I was rooting for Peggy to not wind up with anyone, because the real joy of the season wasn't watching Peggy awkwardly flirt or be flirted at, it was seeing her interact with the many female characters the show included. That's where the show really flew - because even if the character was an enemy or a sidekick or a noncombatant, Peggy still treated each woman as a valuable and intelligent person with something to offer. And so did the show. Despite the tragic lack of Angie Martinelli (Lyndsy Fonseca) - and how hard would it have been to shoehorn Angie's acting career into a season in Los Angeles, come on - this season of the show was unrepentantly about the ladies. 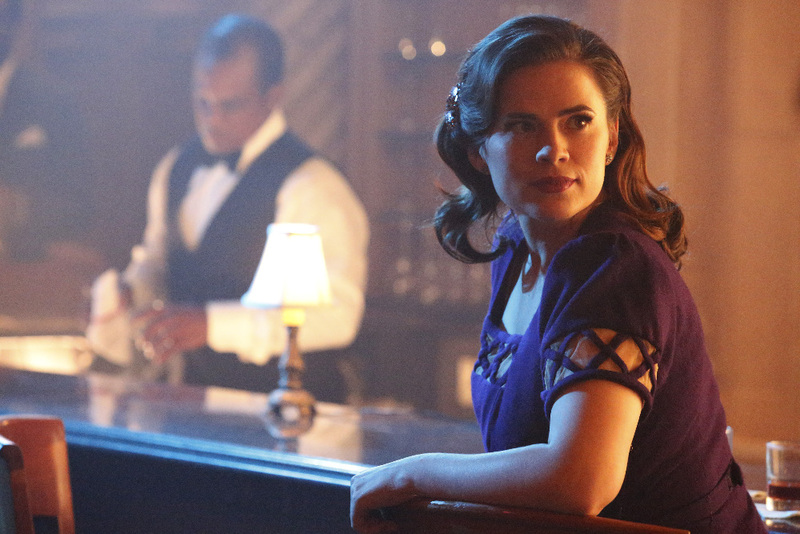 Peggy's relationships with women formed the emotional core of the season, whether they were antagonistic or familial. 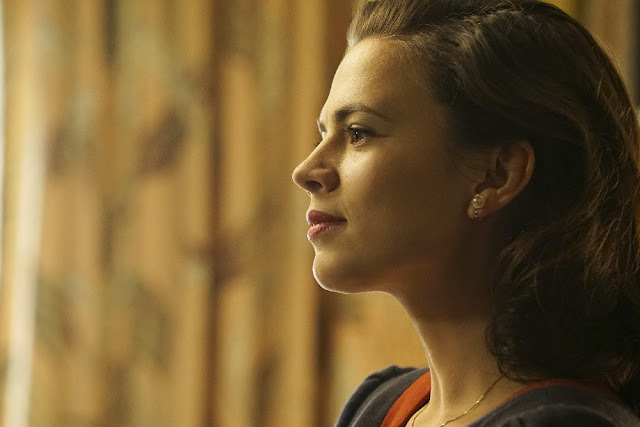 Starting with Dottie, Peggy's adversary from last season who basically functions as the anti-Peggy, the show made it clear that Peggy isn't the type of woman to assume only she is capable and smart. She's not a "guy's girl" who says she's "not like other girls" - in fact, Peggy assumes that other girls are like her, intelligent and conniving. So when Dottie is clever enough to get around every other interrogator and keeps demanding Peggy because only she has the wits to match, Peggy isn't surprised or scared or embarrassed. She's annoyed because she told them that would happen and no one listened to her. And when Peggy needs help and has no where else to turn, she goes to Dottie because at the very least she knows Dottie is good at what she does. Or take Whitney Frost. Whitney's supposed to be the antagonist of the season, and she's a fantastic one. She's unhinged but tragic, a portrait of a woman who can't see any other way to get what she so desperately wants. Whitney is deserving of (and will get) her own article on here, but it's worth noting today how her relationship with Peggy might be antagonistic, but it's still founded on mutual respect. Even before finding out that Whitney is actually a secret genius, Peggy still respects her as a formidable opponent. She gets that Whitney is scary good at what she does, even if she doesn't know why. And for Whitney's side, she might loathe Peggy and all she stands for, but she also understands her. They're two women who have had to fight their ways up in male-dominated fields. They get each other. Upon discovering proof of Whitney's genius, Peggy doesn't try to deny it or in any way denigrate it. Instead she instinctively grasps the tragedy of Whitney's story: that a woman so brilliant saw no way to succeed in the world using her mind and was forced to rely on her body and looks instead. That's not any point against acting or modeling or using your looks, by the way, and the show reminds us that Angie does that and does it well and it's no bad thing. Instead the tragedy comes from the fact that Whitney doesn't seem like she wanted to. Like it was her only option, and she could never pursue what she actually wanted. Peggy gets that, which means that instead of seeing two women in a "catfight" on the show, we get two talented and brilliant people facing off in an ever-escalating battle. It's great. This ethos doesn't just extend to the major players either. Rose (Lesley Boone) might "just" be the SSR's receptionist, but as Peggy points out, she went through the same physical and weapons training as all the men in the office. When Sousa tries to argue against Rose's inclusion because "he worries about her", Peggy shuts him right the hell down. Rose is capable and strong and a great fighter and they need her. No buts about it. And Rose respects the hell out of Peggy right back. She's not resentful that Peggy's role in the war helped her bypass the blockades put in front of other female agents, she's just glad that someone got through. So Peggy turns around and gives Rose a leg up, bringing her into the fieldwork and allowing her to show how she really is the equal of any of the men in the SSR. Ana Jarvis, by contrast, is not much of a fighter, but that doesn't mean she's not still valuable and fascinating. The show makes it clear that while Peggy and Ana don't have much in common superficially, they're still quite capable of bonding and respecting the hell out of each other. Ana is emotional and extroverted and kind and gentle, and she likes sewing and cooking and hugging, all of which are things that do not describe Peggy Carter. But they still love each other. Peggy appreciates that Ana knows things she doesn't, like how to sew a holster into a garter or how to prepare big meals that satisfy a horde of crime-fighting secret agents. Peggy and Ana don't have to be similar to respect each other. They can both understand that their differences just give evidence to the wide array of possibilities for feminine strength. Plus they get to laugh about how silly Jarvis is together, and we all need friends like that. But if any single character exemplifies how solidly the show and the character refuse to put women in competition with each other, it's Violet (Sarah Bolger), Daniel Sousa's girlfriend then fiancee then ex. She's the woman who he's dating to get over Peggy Carter, the woman who Peggy is ostensibly in competition with for his affections. Violet is a nurse, living in Los Angeles, a kind, good-hearted woman who loves Sousa a whole hell of a lot and would be totally in her rights to feel threatened or uncomfortable with his super attractive coworker who he talks about all the time. Violet, however, is not uncomfortable with Peggy, and Peggy is not uncomfortable with Violet even when she realizes that the man she kind of had a crush on has moved on. Nope. Instead the two of them quickly start chatting and grow to like each other a great deal. Violet even tries to invite Peggy out to dinner with them before work intervenes. In other words, until there is irrefutable evidence that Daniel Sousa is still in love with Peggy, Violet just chooses not to care, and Peggy in turn chooses not to be angry that Daniel chose Violet over her. Why would she be angry? Violet is amazing. Even later in the season when Peggy gets hurt and Violet realizes that Daniel isn't over her, she doesn't take this knowledge out on Peggy. She knows that this isn't Peggy's fault at all, and she remains perfectly kind and professional and lovely to this "rival" in love. No, instead it's Daniel who Violet is disappointed in, because she is a grown woman who knows that he's a grown man and expects him to behave as such. She's not mad that he loved Peggy once. Peggy's great, why would she be mad? She's angry because Daniel didn't tell her and because he's not over her. Those are completely valid points and also a very solid reason for anger. But it's worth noting because so often shows will take the easy and insulting route of pitting Violet and Peggy against each other. Of making them options he can choose between, and of making them think that they are just interchangeable options in competition for the same man. That's the lesson, if any exists, of Agent Carter season two. And it's hard not to see a connection between this stance and the way female-lead shows are constantly pitted against each other. By making an entire season about how Peggy refuses to treat any woman in her life without respect and dignity, even her enemies, the show steps above the fray and reminds us that having more than one female character and more than one female show is a really really good thing. It's like those stupid "Make Me Choose" gifsets on Tumblr. I know that's a super specific reference, but it's a quick way of making people choose between two (usually female) characters. I hate those. You know why I hate those? Because they are asking you to determine which female character is "better". Who do you like more? Both isn't an option here. You have to like one or the other. You can like Supergirl or Jessica Jones or Agent Carter, but heaven forfend that you like all three. Except, you know, most people do like all three. Most of the people I talk to about this like all three of them, or even just a couple, but they like them or dislike them for their own reasons, not because they can't imagine having three shows about female superheroes at the same time. The world is well big enough for them all, chickadees. The world is big enough for ten more like them too. 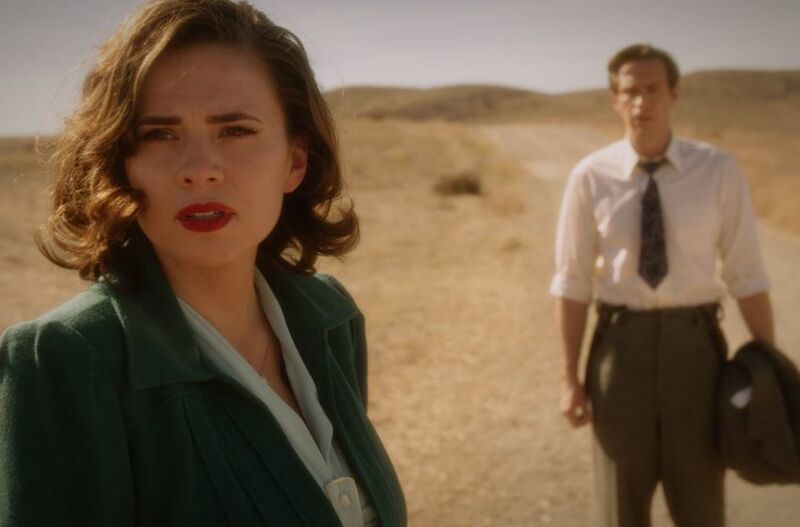 I didn't love the love triangle or the constant moaning from the white men's chorus this season on Agent Carter, though I did like that the villains here were actually privileged men. But this season will get a special place in my heart for how damned hard it went in making sure that Peggy Carter got to interact with and respect the hell out of so many female characters of so many different types and backgrounds. The show's still white as hell and has a long way to go in terms of diverse representation, but in this particular way it did a really good job. Women aren't in competition with each other. At our best, we're there to give each other a leg up and to spit in the face of oppression. But even at our worst, we can at least respect each other and behave with dignity in our conflicts, because we all know we're worthy of that from others. Do the right thing and renew this show, ABC. Do it.